There are so many amazing sites to see in Hoi An to get an authentic cultural experience like colorful alleys of antique houses or attractive multicolored lanterns at night. But if you miss Hoi An’s signature dishes – an art of harmony and moderation, you will be kicking yourself later. If you are looking for a fool-proof list of what to eat on your Hoi An private tours as a starter, tickle your taste buds with these top dishes you absolutely have to try. Plan your Hoi An holiday packages to enjoy delicious food now. With all Hoi An’s magnificence, you may be surprised to discover one of its special treasures comes in a dish of chicken rice. It is clear that the chicken, which is raised naturally in countryside garden is undoubtedly a key component of the dish. I personally think the main event is the rice, which is well-seasoned before being cooked with chicken fat, chicken boiling stock, and pandan leaves on wood-fired clay ovens, though. Normally, rice is only cooked with plain water. But chicken boiling stock (from poaching the whole chicken) will make it more tastily rich. A killer plate of chicken rice that is known for being tender and juicy. It is best completed with a small bowl of soup containing some chicken giblets like heart and liver will make all of you eye-popping and jaw-dropping. A dish pleasantly yellowed rice luxuriously topped with hand-shredded chicken and herbs, cơm gà is the one culinary event; that you definitely should not skip on your Hoi An private tours, no matter how long your trip is. 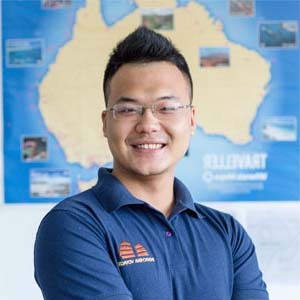 Where to find best com ga in Hoi An? Cơm gà Bà Nga– Ms. Buoi Restaurant at 8 Phan Chu Trinh Street, Hoi An. Price range: VND 30,000-50,000/per order. Opening hours: 10.00 AM- 09.00 PM, daily. Cơm gà Ty – Mr. Ty Restaurant at 27 Phan Chu Trinh Street, Minh An, Hoi An. Price range: VND 25,000-50,000/plate. Opening hours: 09:00 A.M. to 10:00 P.M., daily. Cơm gà Hương on the pavement outside 48 Le Loi Street. Price range: Opening hours: at around 02.00 PM, daily. Cơm gà Xi at 47/2 Tran Hung Dao Street, Hoi An. Price range: 20.000 – 50.000 VND/ a plate. Opening hours: from 9:00 A.M. to 9:30 P.M.
Hoi An is known for its Quang style noodles, also known as Central Vietnamese noodle dish. It is a dish of thick rice noodles mixed with the broth made by simmering meat (typically chicken, shrimp, or pork) in water or bone broth with fish sauce. The yellow broth – a mixture of peanut oil fried with onion is then seasoned with black pepper, shallots, and cu nen – a pungent, garlic-type vegetable. The richness of protein ingredients like hard-boiled quail eggs, snails, chicken, fish, squid, and even frogs brings out the sweet and savory flavors of the broth that perfectly compliment the thick flat rice noodles. All locals know Hoi An has the best Mì Quảng. You will not only eat the noodles but experience the ritual. It is served in a giant bowl with flavorous broth ladled about 1-2 cm deep and garnish, like peanuts, rice cracker, green chili, basil, mint, and Vietnamese coriander. To make the mì quảng authentic, Grab your chopsticks in solidarity and squeeze some lemon/lime juice! 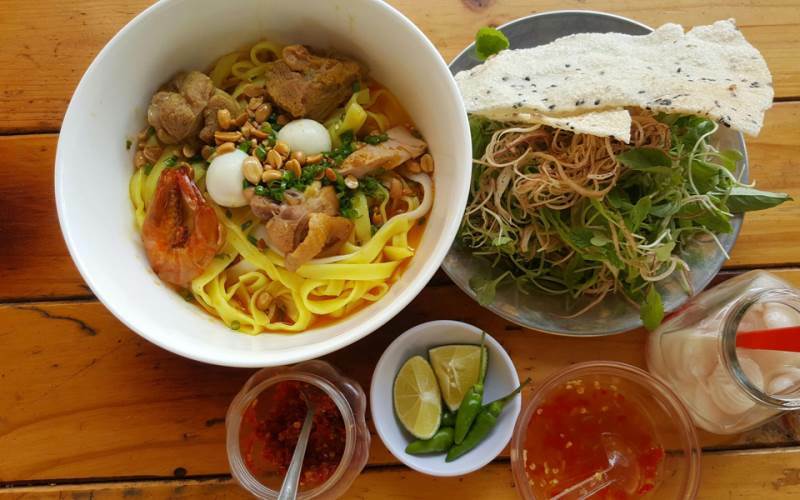 Where to find best Quang noodles in Hoi An? Hai Restaurant: 6A Truong Minh Luong Street, Hoi An. Price range: VND 50,000/a bowl. Opening hours: 9AM-10PM, daily. Cao lau Bich Restaurant: 272 Hung Vuong, Thanh Ha, Hoi An, Quảng Nam. Price range: VND 40,000/a bowl. Opening hours: 6:30AM-8:30PM, daily. Mi Quang Chi Ha on Thai Phien Street, Hoi An. Price range: 15.000 – 20.000 VND/ a bowl. Opening hours: 7:00 A.M. to 7:00 P.M.
Hoi An’s bánh xèo (sizzling rice pancake) is smaller yet stronger in flavor comparing with its Southern cousin. 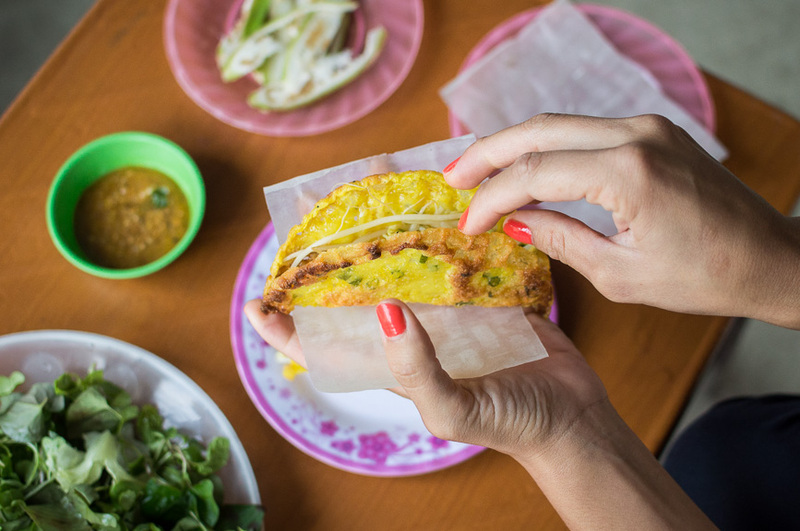 As these thin crispy bánh xèo arrive, ask your servers to demonstrate how to fold these up into bite-size packets of pancakes and fresh lettuce leaves—which can then be eaten by hand. It is important to eat it when it is hot so that the “pancake” stays fatty and crunchy. Yes, it is fair to say that there will be a good bit of smiling as you eat bánh xèo on your Hoi An private tours. For a traditional dish like this, it makes sense to head to a more traditional part of the ancient town like street vendors and little eateries. Where to find best bánh xèo in Hoi An? Bale Well Restaurant at 45/51 Tran Hung Dao, Minh An, Hoi An, Quang Nam. Opening hours: 03.00 PM – 10.00 PM, daily. Needless to say, hundreds of exceptional dishes and snacks in Hoi An can make you confused about where to start and where to eat a daunting task. Besides picking out the dishes we think best represent food in Hoi An, we also give suggestions for where to eat them. 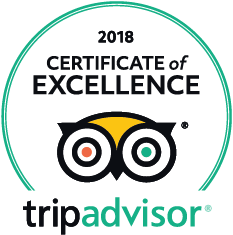 Whether you are a first-time travelers or an experienced foodie, they are absolutely must-not-miss dishes on your Hoi An private tours.